Vole O'Speed: Whatever happened to the Biking Borough money? After Boris Johnson won the 2008 London mayoral election, he formulated a new cycling strategy which involved ditching Ken Livingstone's London Cycle Network Plus programme, which had run into the sand because of a lack of political will to tackle the main barriers to cycling in London like dangerous junctions, and was never predicated on high-quality infrastructure standards anyway, and replacing it with a combination of the first-generation Cycle Superhighway plans, to affect mainly Inner London, and a project called Biking Boroughs, which was for Outer London. The funding and the conception behind these routes is so calamitously inadequate to the task that they will be a total waste of time and money, and, worse, will attract inexperienced cyclists onto main road routes that have not been made any safer than they are now, with junctions that are still highly dangerous and unsuitable for all but the most skilled with-traffic cyclists. Later came the much-publicised deaths on the 'calamitously inadequate' Cycle Superhighway 2, and following LCC's Go Dutch campaign and the appointment of Andrew Gilligan as Cycling Commissioner, we have a programme to rebuild the Superhighways to proper standards (or at least much better). The greatest unmet potential for growth can be found within outer London – 54 per cent of potentially cyclable trips – and only 5 per cent of the "total potential‟ in outer London is actually cycled, compared to 14 per cent of that for central London... and 9 per cent for inner London. The "total potential‟ is defined as the total number of trips currently cycled added to the number of potentially cyclable trips. This was without doubt a true statement, given that so much of London's population lives and moves in the outer Boroughs, and given that cycling is so low there now, and yet one that gets us no further towards achievement of that potential without any definition of the standards that should pertain in the Outer London cycling environment, which were not hinted at by this study. Vagueness was thus built into the Biking Borough concept from the beginning. Thirteen outer London boroughs were given a share of £4m funding over three years to help raise the profile of cycling, improve facilities and highlight safety awareness locally. The answer is simple. A ‘bike hub’ is usually a shopping centre full of cars which contains no cycle parking. To access the ‘bike hub’ simply get on your bicycle and follow the signs that read ‘CAR PARK THIS WAY – PARKING FOR 600 CARS’. Remember to watch out for drivers of lorries, vans, 4X4s, Audis and BMWs, as these drivers find it particularly difficult to see cyclists. If your local council is ‘Green’ you might find some cycle stands tucked away around the back of the car park block. These are rarely signed but it is always well worth looking for the waste containers. Remember that most bike stands are traditionally located in close proximity to rubbish. A full report on all Biking Boroughs will be published in 2014 including results, case studies and lessons learned. We are now almost at the end of 2014, and I have seen no sign of this report. It should be interesting. I can, however, report on what happened in one borough that was awarded Biking Borough cash: Brent. Brent was awarded £294,500 of Biking borough funding to be spent in 2011/12, 2012/13 and 2013/14. This was one of the largest awards to any borough. This followed the production of a TfL-funded report for the council on the state of cycling in the borough. Anybody could have told them for free that the state of cycling in the borough was 'dire' or 'virtually non-existent', but this is not how local government works. Every time there is a new project, and any funding to do anything at all, first of all, a large tranche of that funding has to be spent on a report from external consultants that tells you what everyone can see anyway. This MVA Consultancy report does a professional job of identifying the poor condition of cycling in Brent. However, it doesn’t diagnose it because it is incapable of understanding the reasons for it, and therefore its cures for the condition are rather like medical cures of the pre-modern era – a mixture of quackery and superstition. All the traditional cycling folk remedies are here – cycle training, signposting, promotional activities, recycling old bikes – and none of them will save the patient. This report shows no understanding of the central importance of addressing subjective safety. Instead of safe and convenient cycling infrastructure what is really on the cards is developing relationships with parents to ‘encourage’ them to send their children to school on bicycles. It won’t work. Cycling will at present only increase to the extent that people can be persuaded to cycle in Outer London traffic. There are few signs that persuasion and minimalist new cycling infrastructure will ever be enough to encourage the surge in cycling which even the Mayor’s deeply unambitious target requires. Cycling in Brent appears every bit as doomed to stagnate as it does in the London Borough of Waltham Forest or in any other Outer London borough. The stated objective for the “Biking Borough” is to achieve a 5% modal share of trips by bike (TfL’s statistics say that the modal share is currently 1%). The main problem with this forum, in our view, was a general underplaying, or a lack of understanding, of the role of the physical environment in determining cycling levels. There seemed to be a naive view amongst some, including the consultants, that raising the levels of cycling in Brent would primarily be a matter of promotion or publicity. A concept of a “Cycle Hub” was being discussed, but it was entirely unclear what this was supposed to be. Boris has apparently introduced this concept, but not defined it, and it is up to boroughs to interpret. It seems, however, as if it is not going to be primarily conceived as the provision of physical infrastructure. Participants were asked if they thought the strategy should focus on trying to get more cycling from communities in Brent that already cycle quite a bit, or on trying to reach the communities that are highly reluctant to cycle, such as the Asians of north Brent. We do not think that making any such choice is desirable. We believe that the cycling environment needs to be improved radically across the whole borough, and that doing this would, pretty much automatically, raise cycling levels in all communities. The measures that need to be taken are well-known, it is a matter of political will and the commitment of funding. The main points we were keen to emphasise were the widely- perceived danger of cycling on Brent’s roads, which will not go away with a bit of promotion, and the lack of cycle permeability of the borough, with the major barriers of the North Circular Road and the railway lines preventing the creation of attractive and safe cycle routes. Until the major funding needed to address these is forthcoming, we do not see much prospect of Brent really becoming a “Biking Borough". What the headings on the left really meant always remained a mystery to me. But I can tell you that the 'cycle hub' selected was in the south of the borough, in Kensal Green. SKM consultants were engaged for three years to find ways of spending this money around this area (which was already pretty much the highest-cycling area of Brent, owing to it being fairly affluent and only three miles from the West End, and having no major main-road barriers worse than Maida Vale and the Harrow Road, and already a reasonable functioning twisty backstreet London Cycle Network route from the West End (via Hamilton Terrace, Blomfield Avenue and Shirland Road)). They thus thought that in a borough with generally exceptionally cycle-hostile infrastructure, this area would be the easiest nut to crack. What the 'cycle hub' actually amounted to in the end was the installation of cycle stands, mostly at Kensal Green, Kensal Rise and Queens Park Stations, and other places on the streets, and provision of numerous blue direction signs around Kensal Green, giving cycling mileages to various destinations. The roads were not improved in any way at all, except that there was contemporaneously, and seemingly incidentally, not funded out of the Biking Borough budget, a programme of installing cycle-unfriendly speed cushions and speed tables on residential roads in the area. Cycling remained firmly banned in Queens Park, under the control of the Corporation of London, and so there remained pretty much zero traffic-free space for cycling in the area, and no-where to take kids to teach therm to cycle. 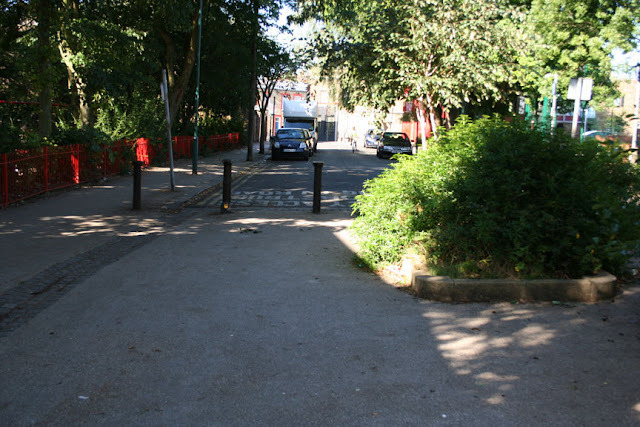 Allowing contraflow cycling on Clifford Gardens, just north of Kensal Rise Station. Tiny and profoundly unambitious, or 'realistic', if you will, as these schemes were, none of them were realised. The reasons are too tedious to go into at length. Scheme number two produced another set of meetings and a consultant's report, which proposed a bad fudge that no-one liked, and again that scheme never made progress. The consultant's suggestion of widening the barrier to create a cycling refuge in the middle of Brondesbury Park would just have created more problems for cyclists on that road. The solution for that location was clearly, and still is, clearly, for the barrier in the middle of the main road to be moved to one of the side roads, and for a cycle gap to be made into it there, with maybe a combined cycle-pedestrian crossing of Brondesbury Park to aid cyclists in getting across from one side road to the other. But that would be a change to the traffic system, with changes to allowed movements in and out of the side roads. Though this change would not necessarily be 'anti-car', car movements here are restricted by the current setup, Brent officers believed they would not win any consultation of residents in the area on such a change, which they believed firmly could be painted as being 'anti-car'. So nothing has happened, despite children and staff at Malorees Primary School in Christchurch Avenue, a school which is doing its bit to encourage cycling, wanting a route across here. This should have been a classic 'easy win' for cycling, but it couldn't be achieved in the three years of Bikling borough funding, though it remains on the Brent Cyclists Space for Cycling 'Ward Asks' wish-list. 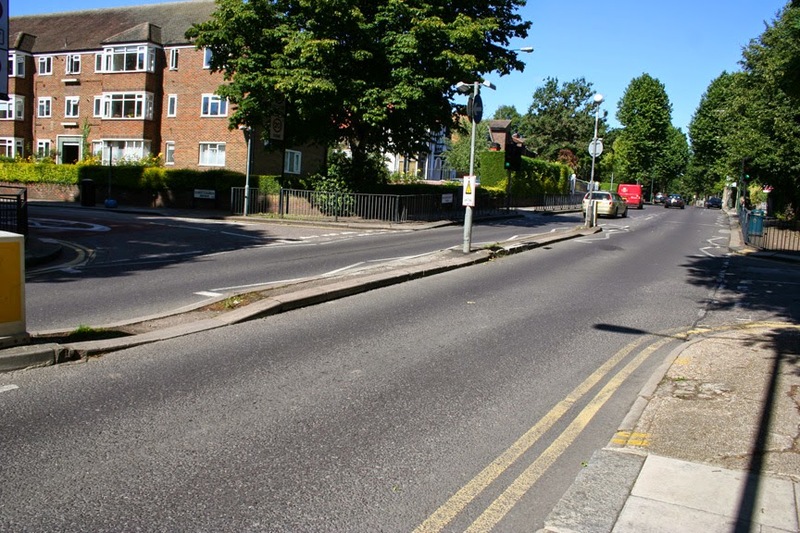 Scheme 3, the contraflow on Clifford Gardens, a side-road off Chamberlayne Road, planned to connect with an existing contraflow (one of the few in Brent) on Bathurst Gardens, got further than all the others. Though there were doubts amonsts some cyclists as to how well this might work, with parking on both sides of this narrow road, and a need, if it the scheme were implemenred, for cyclists to face down some fast rat-running traffic in the confined space, it was supportyed by Brent Cyclists, as really the last hope of getting anything concrete out of the Biking Borough project, and it was designed and went to consultation. The results of the consultation were 52% in favour, 48% against. Brent Council decided that this was too close a margin, and abandoned the project. I am pleased to confirm that a total of £294,500 has been awarded to your borough to fund proposals relating to the development of Cycle Hubs, Cycling Communities and Raising the Profile of Cycling locally as set out in Table 1 below. I would like to congratulate you on the scope and quality of your bid. So even where a consultation was won, on the last-ditch attempt to push some change through using the Biking Borough cash, Brent Council turned back. So much for the 'local political commitment to increasing levels of cycling'. So much for the 'proposed changes'. So much for the 'step change in levels of cycling and good value for money'. The £294,500 awarded to Brent disappeared into promotional activities (such as dubious victim-blaming things like "Exchanging Places"), some funding for training courses and Sky Rides, and production of a promotional booklet about cycling in Brent, which contained basic errors, like a map that showed a route that did not physically exist, and promoted the dubious ideas that cyclists were safest using cycle infrastructure where available and that they should always wear a helmet. I can't say anything about the Biking Borough projects in the other twelve boroughs. But the way the Biking borough played out in Brent was a scandal. The £300,000 went down the drain, emptied into the pockets of consultants and the people who made the blue signs, so purposeless in the absence of meaningful subjectively-safe routes on the roads they signposted. Only the few thousands of pounds spent on the cycle stands could be said to have been possibly money well-spent. The £300,000 went down the drain because it was 'calamitously inadequate' to the task in hand, and nothing it could have been spent on would have caused substantial progress in raising Brent's cycling level from the existing 1% modal share to the Mayor's target of 5%. But it had to be spent, so it had to be wasted. After the money for the studies, money for leaflets, money to pay the lorries to come and do 'Exchanging Places', money for the events organisation and for the trainers was taken out, there was too little left, divided three ways between three tiny infrastructure schemes in a small (and anyway already relatively cycle-friendly) area of the borough, far from the disastrous cycling environment of the North Circular and the suburbs beyond, to even achieve those tiny schemes, given councillor-level indifference and officer-level timidity. The Biking Borough project left Brent exactly as it had been before for cycling. Because it was such a small amount of money, I suppose no-one really cared about it. Boris's second term cycling strategy looks far better, because Andrew Gilligan has removed much of the fluff around 'cycle hubs' , 'cycling communities' and 'raising the profile', and directed a much larger investment into much clearer infrastructure objectives. The three Outer London mini-Holland schemes in Walthamstow, Enfield and Kingston are each getting about a hundred times the Brent Biking Borough allocation. This is enough to matter, enough to make a difference, if spent wisely, and enough for people to care about getting wasted. On the other hand, some of the issues that bedevilled Brent's biking borough could come back to haunt the current mini-Holland and Quietway projects, and they should not be neglected. The Brent failure needs to be learned from, and I await this promised report into the overall effectiveness of the Biking Boroughs with much interest. Even if a sensible amount of money is provided to change an area of car-dominated Outer London, and even if it is not, this time, divided up into such small parts that nothing useful can actually be done with it, the same risks exist, of council double-speak, consultant opportunism, lack of engineering and administrative competence, timidity and foot-dragging, to waste it all again. Four years after the Biking Borough study, and two years after its mini-Holland bid failed, Brent is conducting a survey to inform a new cycling strategy. There appears to be no limit to the amount of paper that can be pushed before we get the real infrastructural change in Brent that everyone interested in the subject can see we need. Since the end of Ken Livingstone's LCN+ project in 2008, not a single, tiny piece of cycling infrastructure has been built in the Biking Borough of Brent. Outer London has been let down by the very person it voted for. In our area, the BB money paid for a cycling officer (4 days a week - who was actually brilliant, but left a while ago to a better paid and full time job) who tried to get more cross council thinking on cycling (more of preaching to the converted as it has turned out). We have installed loads of cycle parking on street and in communal areas for flats. Cycle maintenance courses have also been set up, along continuing to fund Bikeability in schools. I am sure there was other things, but apart from cycle parking, no infra. We have designed concepts for 3 cycle to school partnership schemes (filtered permeability, cycle track links etc), nothing has been funded. We have a pretty big list of very small schemes which open up areas for cycling, nothing has been funded. We do have a modest scheme for one of our town centres, but it involves signals which means time and effort. Quietways have been looked at, alternatives to TfL's mapping suggested and ignored (Gilligan has proposed routes we didn't even know we should have been looking at!). David, I try to keep positive, but it is hard. There is no funding and no will to do real transformational things and London has been let down by this Mayor. A problem that exits in Brent Council is chronic confusion between cycling as transport and cycling as sport. The council has a 'Cycling Steering Group", but this is organised by a Sports Development Officer working for the Sports and Parks Service, and it talks pretty much entirely about British Cycling, Sky Rides in parks, BMX, etc. This is all in fact pretty funny for a borough that still has cycling in all its parks formally banned under Edwardian by-laws. I came across in their last minutes the fact mentioned that Willesden Cycling Club holds the world 24 hour time trial record. What on earth this has to do with getting kids to school in Brent I can't imagine, except perhaps to speculate that they need to emulate this record to cycle on the North Circular. With such a weird attitude to the whole subject, it's no wonder that the need for infrastructural reform is not understood in the council. Sadly this is not just a London or even English issue. Here in Wales we have The Active Travel Act. Carwen Jones the First Minister proudly announced that he wanted Wales to be like The Netherlands (forget the mountains and low population density outside Cardiff for a minute!). But, there is no additional money (additional to none anyway so hey ho), and before the Pill was even passed it had been transferred from the remit of the Secretary for Economics and Transport to that of Sport and Leisure. we have lots of "guidance" but nobody to actually drive it. "Fine words butter no parsnips". According to Phil Jones at the recent Cyclenation/CTC conference, the responsibility for the bill is back with the Welsh Transport Secretary. At least in this case the Bill is clearly about infrastructure provision and there seems to be a fairly strong attempt to define the standards (though they are not mandatory). This is altogether more clarity than the Biking Borough project had. I do think clear route standards are the first step, and money is what we need to demand second. Otherwise we get more non-Dutch "Dutch" roundabout fiascos and the like. Manchester seems to have a slightly more grand take on "cycle hubs". Ours have secure parking, and in at least one case showers, changing facilities and a retail unit (which also runs bike maintenance courses). This might sound like a step up, but I would make the following points. - They're really expensive. The local authority has spent huge amounts of cash on them which could have been spent on real changes to roads. I need a safe route to get the family into town by bike. Showers? Not so much... And the users have to pay to subscribe. - The central station hub could be a handy place to leave my bike when I take the train for a weekend away. Manchester Piccadilly doesn't have secure bike parking because of terrorism (apparently, and despite having lots of car parking). But when I arrive back on a Sunday night the hub is closed. So that's no use at all. As one of the old SKM team involved with the Brent biking borough, I can tell you there was no lack of dedication on the part of that team working on the project. I remember well cycling the highways and byways of the Kensal Rise 'cycling hub'! The frustration was really lack of money. Dealing with just one of the major barriers would have wiped out the entire biking borough budget. And that's just dealing with barriers, let alone actually implementing anything pro-cycling, such as highway infrastructural measures. So the situation described above should be no surprise. I hadn't realised that the council had not taken taken forward the schemes you mention above. That is a great pity. At least the mini-Hollands look a bit more promising - well some bits anyway. Hi David, I have to correct you about no cycling infra having been built in Brent since 2008. In the Willesden Green/Dollis Hill area, a few cycle signs and white lanes have been painted on the road. They are usually short, lead straight into parked cars and incite cyclists to ride in a dangerous position right next to the curb at pinch points and intersections, but they're not nothing. Nothing would have been better. Oh, and 5mph "speed limit" signs of dubious legality have been put up in Gladstone Park. The bits of lane around Dollis Hill are re-paintings of markings put in for old LCN routes, as marked on the London Cycle Guides, so are not new. The bits of advisory lane in Walm Lane and Chichele Road are indeed new, but useless as you point out as they were just put in between blocks of parking. This makes me so cross! It is clear that nothing meaningful could ever have been achieved with such a pitiful amount of money, never mind the bureaucratic skulduggery - to even offer it was an insult. The people who offered it and the people who claimed it should pay it all back equally between them.